Josh is busy building a life-size battle mech, but that doesn't mean he doesn't have time to chill with Emily and listen to some fantastic listener suggestions. Join them as they ponder a world where VGM can be found across the radio dial. Then, stick around to watch Josh vault Emily into a state of uncomfortable teenage emotions as they try to answer the age-old question, what makes the salaryman sing? All this, plus seasonal jams on this week's installment of The VGM Jukebox! P.S. This week features information about our upcoming crossover with PixelTunes Radio, including information on how you can participate. Get ready! Thanks for playing my track. How about that Stereo sound seperation which I totally neglected to mention in my testimonial though? To help your internet radio dreams come to fruition, you might want to check out Kohina. I know I've mentioned it in the past, but it's a long-running internet radio site that plays video game music (mostly C64 and chip tune, but also other systems). You could emulate their setup if you ever become serious about it. And if you ever do, I would love to contribute a radio block. Great episode! I have the perfect story and dedication for you guys. Now I just need to find a VGM chune that captures the emotion of the story. I'm terribly sorry about this but it appears as though I have not done my due diligence in naming my track selection and notifying you of what it was. As much as I love the track you played (and let's face it, this one also gets the blood pumping), there are two different versions of Splattack! and the one I had intended for you was the Jam Session version which can be heard here: https://youtu.be/qXrNDSpibrc. Now do you hear the bass I meant for you? Again I feel terrible for my miscommunication and I will do much better about accurately suggesting tracks in the future. Nonono! Don't feel terrible! As you know from listening to the show, you are far, far from the first victim of this issue. And anyway, if you think about it, mixups are just a way of getting more VGM out to the masses! We'll play the correction on the next episode, and I'm sorry for the mistake. No need to apologize. You both are working very hard to make sure you get a show out regularly for your patrons and you don't deserve to have me breathing down your neck about my selections. I just had a suggestion: I like your banter, but sometimes when I'm working I just like to hear the music. Will you guys do more music only mixtapes for your episodes? I think that would be cool. "Good evening listeners. You are listening to KTUX: Tuxedo Boy Radio. 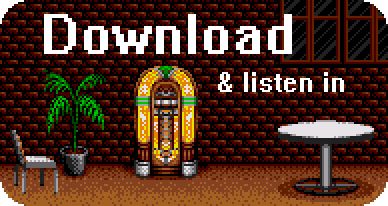 The most elegant VGM jams for discerning listeners like you." That Obondori tale makes me so sad! The first time around, I thought the character Josh was creating sounded a little quaint. It’s only now I realize he’s describing my Japanese doppelgänger.